The first step in upgrading the AI is ensuring that defenders are aligned in the correct place to give them the best chance at executing their jobs, thus the first piece of the run fits system is the new Defensive Auto-Flip feature. 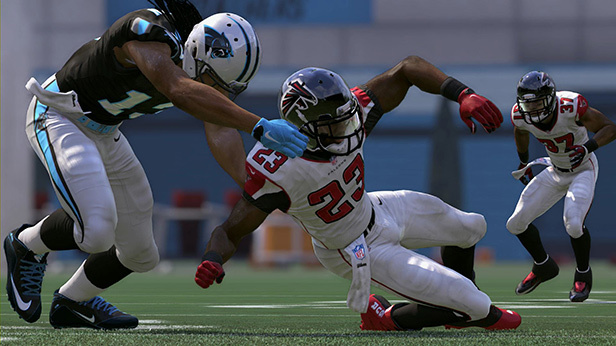 The AI will automatically flip your defense when the offense flips so that your defense aligns to the proper strength in relation to the offensive formation they are seeing after the huddle break. When your defense has been flipped, you will see visual feedback in the Score HUD to tell you that your defense has been flipped, as well as what part of the defense was flipped (Entire defense, Coverage, Front). 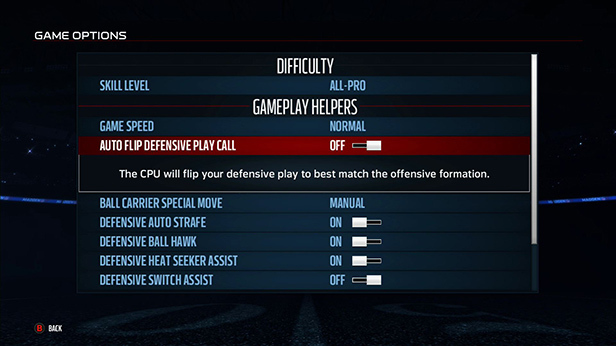 And if you prefer to handle all the alignment yourself, the Auto-Flip feature can be toggled OFF via the Gameplay Settings menu; the user can also re-flip the play at the Line of Scrimmage just like in previous versions. The next step in the Run-Fits system is Defensive Gap assignments. 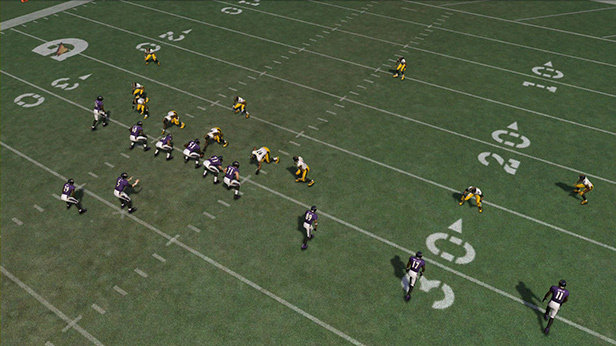 All defenders, both in the NFL and Madden 17 have a specific responsibility on each play – this includes gap integrity for ‘run-fit’ defenders and coverage responsibility plus run-support for coverage defenders – making the play-calling experience more engaging and strategy-based than in previous iterations. The defenders now have AI and behaviors to execute the play called by the user and realize the intent of that decision, and these will be apparent to you both before and after the snap. The individual gap assignments come from the intent of each play and is completely dynamic, both before and after the snap, and even includes gap responsibilities for each defender for plays going in either direction. You can see the desired gaps before the play via Coach Cam Art by using the RS right/left to see the Run-Fit art for either direction. The number of ‘run-fit’ defenders is completely dependent upon the specific play you call on defense. Defenders who are considered to be ‘run-fit’ defenders are the players that are ‘Run First’ players and the art will show where their fit is, which will dynamically update to match the formation of the offense. These are the players generally inside the tackle box and/or players who are critical to each specific play type (for example, in Cover 4 plays, all the defenders in the box will show as run-fit defenders, plus the two deep safeties are run-first players within this scheme). Some defenders will not have a run-fit or gap because they are ‘pass-first’ players, but will still react to the run and fill-in as support players when they confirm it’s not a pass play. The decisions you make as the play-caller will have a big impact on your team’s ability to stop the run. Not all defenses fill every gap vs. every offensive formation – if the offense come out in Goal line Normal and your defense is in Quarter 3-Deep, there will be gaps that are not accounted for because the Quarter defense has more ‘pass-first’ players than it does ‘run-fit’ defenders. After the snap is where the new gap logic really separates itself from previous Madden iterations. Just because a defender is assigned to a gap pre-snap doesn’t mean he’s locked to that gap for the remainder of the play. Each defender has AI that allows him to update his gap and react to the war in the trenches to fill the open lanes created by the blockers as the play develops. This AI relies heavily on the Play Recognition Rating. Based on the PRC rating, defenders will be faster or slower in reading the play and finding the right gap to fill. Each player that is not blitzing will start the play in an assignment we call ‘Read and React’. You can see this in action with our new Read and React movement animations, which has players strafing laterally in a controlled state as they read the play, while also leveraging their assigned gaps. Even defenders who are on the line of scrimmage, but not blitzing, will use this assignment to read the play before attempting to make a play. The higher the player’s PRC rating is, the faster he will be able to break out of his read and react assignment and fill the gap he’s targeting. 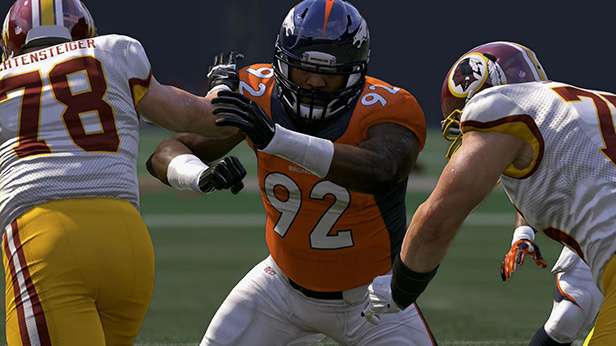 In combination with the ratings of the DL as they engage the OL, a defense with higher cumulative ratings will be more successful at defending the run than lower rated defenses. 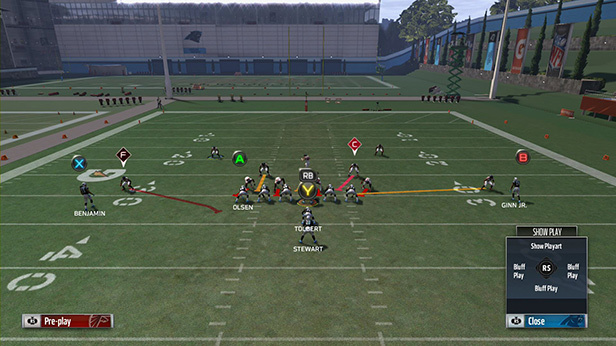 Because of the new Run-Fits system and Gap logic, users on the defensive side of the ball will have the ability to use strategy and realistic football concepts to counter running plays that their opponent uses regularly. The Force Defender is something Madden fans have been wanting for a long time and Madden 17 delivers. The Force player is essentially the outside contain defender to the playside – his job is to ‘force’ the run back to the inside where his teammates are to make the tackle. He tries to play his gap in a way that ensures he doesn’t get beat to the outside and this is reflected by new Force specific blocking animations. So when you want to stop the outside run in M17, call a play with a Force player. Again, just like the defensive gaps, the playcall matters. Not every defense has a force a player, so you’ll want to make sure you are familiar with the plays that have the force player in an advantageous positions to force the run. You can see the Force player by toggling the run-fit play-art – he will be denoted by an ‘F’ icon above his head. The effectiveness of the Force player is based again on the PRC rating. The higher the PRC rating, the faster the Force player will break into his force assignment. Once he is blocked, Strength and Block Shed will determine his success chance vs. the blocker. The Cutback defender is the inverse of the Force player – his job is to play conservatively on the backside of the play so that he is in position to make the tackle if the ball carrier cuts it back away from the playside. 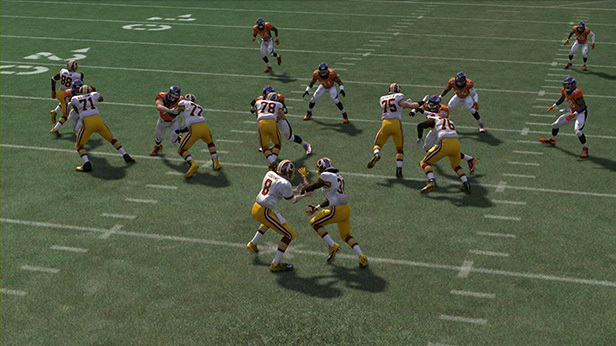 The Cutback player can be DL, LB or DB, it just depends on the specific play called. The higher the PRC rating, the more conservative he will play. 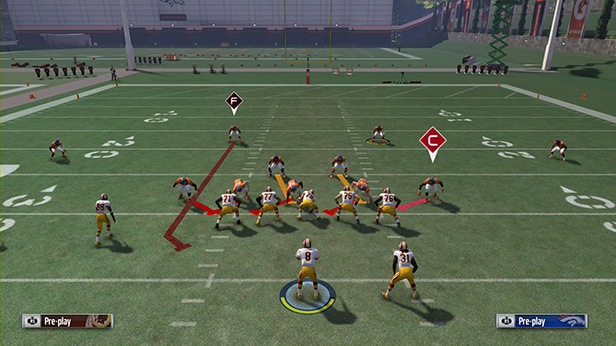 You can see the Cutback player by toggling the run-fit play-art – he will be denoted by a ‘C’ icon above his head. Fill players are the rest of the run-fit defenders who are not Force, Cutback or blitzers. Their job is based on where they are positioned relative to the direction of the run. The fill player to the playside, inside of the Force player, will look to attack his gap with outside leverage similar to the force player – he also does not want to get beat to the outside. The Fill player inside of him will attack his gap with inside leverage and look to make the ball carrier make a decision – either cut back to the Cutback player, or run right into the Force or opposite Fill player. Working together as a unit, the Force, Fill and Cutback players try to make a funnel to force the RB into the teeth of the defense. Again, the play rec. rating determines how successful and efficient these players are. Jet players are blitzers – they can be on the line or off – but their job is simple; aggressively run at the assigned gap with the intent to penetrate. These players are denoted with red playart lines via Coach Cam. This assignment really shows the dynamic nature of the run-fits system. The Crack-Replace defender is a player whose primary job is to support the Force player. He’s not originally in the run-fit and won’t show play-art as such, but he has a job to do in the run regardless. When the Force player gets blocked, or ‘cracked’ by a blocking WR, this player must recognize and read the offense and take over the Force assignment – and it’s all done dynamically. When there is a defensive back outside or behind the force player, he will become the ‘Crack-Replace’ – if you are in a defense where the Force player is on an island, you won’t get the benefit of having a crack-replace player. So again, we’ll emphasize that the play you call matters! 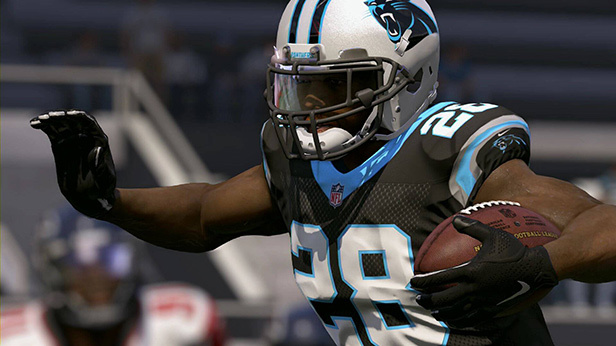 Madden 17 will feature 2-gap players for the first time in its history. A 2-gap player is responsible to cover both adjacent gaps – so he will play the block straight up and try to engage the blocker down the middle so he can read the play and then make a decision on which direction to shed. 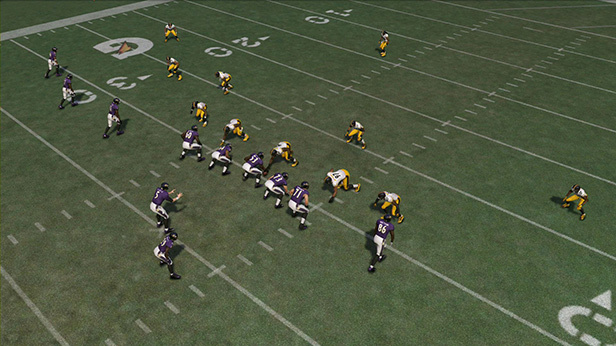 The 2-gap assignment is an AI-assigned technique and used primarily by players on the line of scrimmage in an ‘Even’ alignment (meaning they are aligned head up on an offensive lineman). 2-gap players can be found most commonly in Base Odd fronts (like 3-4). To provide the proper balance for the ground war, many blocking improvements have been made as part of the run-fits feature, with an emphasis on zone blocking AI and animations. With defenders now working to fill gaps created by the blockers, outside zone and stretch-type plays look and feel more like their real-world counterparts, with the defense getting stretched laterally. This creates lanes for the ball carrier to read and gaps for the run-fit defenders to fill. With the new ball carrier mechanics, finding the cutback lane that has not been accounted for by the defense has never felt more rewarding. 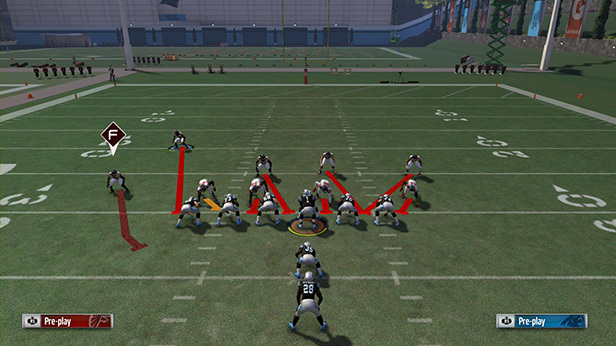 You will also see new laterally moving blocks, such as zone steps, reach blocks, double teams, cut blocks and force blocks that will make you feel ground war just like you see on Sundays. Blockers also have a job to do to execute the intent of the play, so you’ll see the blockers performing their blocking assignments to meet that expectation. Madden 17 has gone deep on both sides of the ball to deliver the most authentic experience run-game experience we’ve ever offered. 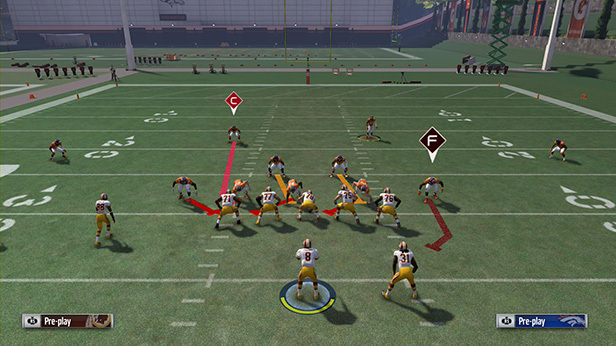 By using authentic run-fit installation pillars – alignment, assignment, technique – on defense and matching that with realistic blocking behaviors and AI, there’s only one thing left to say to say to your team when diving into the ground war in Madden ’17 – DO YOUR JOB!